Well summer’s just around the corner, and I’ve got my fingers, toes and everything else crossed for fine, sunny weather. I’ll be spending as much of it as possible in the garden grilling up goodies for friends and family, or heading off for long and lazy picnics. So, to help you on your way to the perfect summer picnic too, we’re running a competition to give away a snazzy red Bodum FYRKAT Mini Picnic Grill (worth £40) to one lucky winner. Small enough to fit on a bike with its 30cm diameter, but roomy enough to feed two hungry barbecue fans, this cute little grill is perfect for an impromptu barbecue – in between rain showers of course. It features an enamel-coated steel body and heat-resistant silicone handle, and comes in a very fetching shade of red. If you’d like the chance to get your hands on it, just send your favourite barbecue tip to us at competitions@ocado.com by 7th May 2012 (don’t forget to include your contact details!). From sprinkling everything with sugar to cooking fish on a plank, we want to hear it all, and our favourites will be posted on Facebook and Twitter after we’ve contacted the winner. Good luck, and happy grilling! This Bodum Mini Picnic Grill competition is open to all UK residents aged 18 or over (except for anyone directly connected with the planning or administration of this Bodum Mini Picnic Grill competition) who have emailed competitions@ocado.com with their top barbecuing tips by 07/05/2012. Prize Details: There is one prize of one Bodum FYRKAT Mini Picnic Charcoal Grill in red. 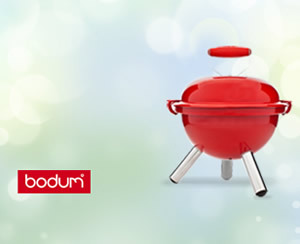 The closing date and time for entries into the Bodum Mini Picnic Grill competition is 23.59 on 07/05/2012. The winner will be picked in the week commencing 08/05/2012. The winner of the prize will be contacted within five days of the competition’s end date, and will be given full details of how to redeem their prize. If the winner cannot be contacted or does not respond within 14 days of the initial notification, or cannot take up the prize, then Ocado reserves the right to select another winner. Your personal data will be treated in confidence and will not be disclosed to any third parties for their marketing purposes unless you agreed otherwise during your registration process. Ocado has organised this competition in good faith but cannot accept any liability relating to the competition or the prize offered. This entry was posted in Talking Ocado and tagged Bodum, competition, Mini Picnic Grill by Ocado. Bookmark the permalink.